The Video Plankton Recorder (VPR) is an underwater video microscope system that takes images of plankton and particulate matter as small as 50 microns and up to a few centimeters in size. Nets and bottles can destroy some delicate zooplankton, and nets also scoop together many zooplankton from a long stretch of water. The VPR lets scientists quickly measure the distribution of zooplankton floating in the ocean, without disturbing them. The VPR has two arms. One has a video camera, which focuses on a point midway between the two arms. A strobe light on the other arm flashes 60 times per second; every time it flashes, the video camera “sees” the particles and plankton in the water at that moment. The images are saved on a computer disk. The instrument is mounted in a frame and lowered into the water from the stern of the ship. 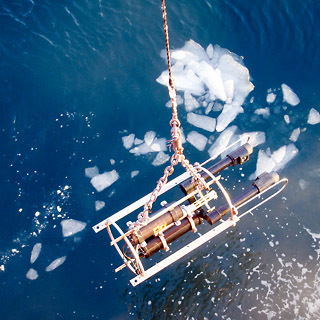 Sometimes, a CTD also is mounted next to the VPR to collect depth, temperature, and salinity information at the same time as each video image is taken.